We’ve seen the incredible out-of-body throws Yoenis Cespedes has made from left field. We’ve seen his power to all fields. We’ve seen his baserunning ability. He is, basically, a five-tool player. So why did the A’s trade their cleanup hitter for Jon Lester and Jonny Gomes? Well, they did it because they believe pitching will bring them over the top and into the World Series. A championship is the one thing that’s eluded Billy Beane’s run of superb teams with a limited budget. Beane has always been willing to give up something to get something. So he gave the Red Sox what they wanted - a centerpiece player who can help revamp their offense, give them outstanding defense and as he heads into his prime years become a more complete player. In a recent discussion with A’s manager Bob Melvin, who threw batting practice to Cespedes almost every day, he commented that at some stage of his career he’s going to pull all facets of his game together and become an even greater force. Cespedes has a .767 OPS but a .303 on base percentage with only 28 walks. That flies in the face of what the Red Sox offense has looked like the past few years, but this is where Melvin believes Cespedes will get so much better. A powerfully built man, Cespedes, who comes in at a shade under 6 feet and 220 pounds of muscle, has 17 homers and 67 RBI for the A’s. He is hitting .256. His value will also be in protecting David Ortiz in the lineup. And with Mike Napoli’s power, the Red Sox now have two power bats in the middle of the order from the right side. The Red Sox outfield is now one of the top defensive outfields in baseball. Cespedes and Jackie Bradley Jr.’s arm should really help deter opposing runners from taking the extra base. If the Red Sox keep Shane Victorino in right and he stays healthy, that becomes an excellent defensive mix. Losing Jon Lester is never good. But if you had to lose him, why not lose him for an impact offensive player? 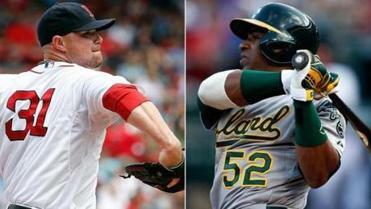 The Red Sox also received a competitive balance pick from Oakland. So this is almost as if the Red Sox lost Lester as a free agent. This way they get the draft pick and they get the All-Star player. The Red Sox traded Andrew Miller to the Baltimore Orioles for minor league pitcher Eduardo Rodriguez. That’s in addition to the well-regarded pitching prospects, 22-year-old lefthander Edwin Escobar and 25-year-old righthander Heath Hembree, acquired in the Jake Peavy trade. Those prospects can bring you established players. As we’ve pointed out, replacing Lester is one of the hardest things to do. We’ve mentioned Philadelphia’s Cole Hamels as a possibility with four years and an option remaining on his contract. A free-agent like James Shields could be a possibility as his price tag will be far less than Lester’s. Cliff Lee could also be a possibility with two years remaining on his contract if he doesn’t go in a deal in the next month. Losing Lester is tough, but with a premiere slugger in an era where power is hard to find the Red Sox came out of it pretty well. Cespedes is a free-agent after next year, so the Red Sox have to begin thinking of an extension for the 28-year-old outfielder. He will make $10.5 million next season.